Let your kids enjoy a different kind of play experience these school holidays where the only limit to how much fun they can have is their imagination. The Playful Endeavour loose-parts playground is back, this time in Glebe Park, with a collection of found and manufactured materials selected to encourage creative play and social interaction. Play equipment is more likely to be hoops, poles, crates, ropes, sheets and tyres than the usual slippery dips or swings. The Playful Endeavour loose-parts playground returns for the Easter school holidays, but this time in Glebe Park, Civic. A collection of found and made materials selected to encourage creative play and social interaction will keep children entertained throughout the school holidays. Families are encouraged to head into Civic during the school holidays to experience imaginative play and spend time exploring the broader city precinct. The Playful Endeavour is provided by the City Renewal Authority to encourage more families to come into the city. It is being operated by Green Hat Workshop, which hosts loose-parts playgrounds around the country. The play equipment is easily moved, adapted, joined and experimented with, which encourages self-directed, open-ended play, a growth mindset, interpersonal skills and fun. The self-directed nature of loose-parts play engages all ages and abilities and complements the traditional fixed play equipment and sports equipment that most Australian children already have access to. This event has been made possible via the City Centre Marketing and Improvements Levy. The Playful Endeavour loose-parts playground is back after it proved to be a popular attraction during a two-week stay in Civic Square last October. Children and adults are encouraged to head into Civic over the school holiday period to experience imaginative play and spend time exploring the broader city precinct. 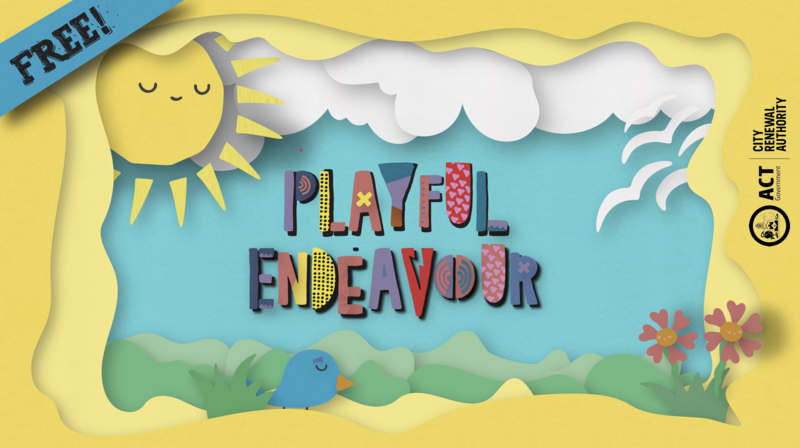 The Playful Endeavour is being operated by Green Hat Workshop, which hosts loose-parts playgrounds around the country.